Jacksonville Forklift Certification, Get Forklift Training in FL! Jacksonville is a northeastern Florida city with plenty of attractions. Both residents and tourists enjoy the famed swimming and surfing of the area, and a relaxing break from the water play to wander through the various museums, restaurants, and other cultural offerings. As a regional business center, Jacksonville is also home to a large working community with plenty of options if you’re looking to start a new career. The city’s strategic location along the Atlantic Ocean makes Jacksonville one of the busiest port cities along the entire U.S. East Coast region. With so many docks, shipyards, and distribution centers around Jacksonville’s shipping industry, there are plenty of companies looking for forklift operators. If you’re looking at forklift drivers in Jacksonville, FL, you’ll need the latest OSHA compliant training. OSHA requires that forklift certification in Jacksonville is the employer’s responsibility. Thanks to FLC, you can have the best training available at affordable prices. It all starts with our forklift certification in Jacksonville, FL. Starting a new career in an exciting city like Jacksonville doesn’t have to require going back to school to get a degree, or spend thousands of dollars. And for employers, it doesn’t mean that Jacksonville forklift certification is expensive. You can train your employees in no time and with little expense by looking into completing a forklift certification in Jacksonville. Why A Jacksonville Forklift Certification? These types of places are all over Jacksonville and nationwide. Becoming a forklift operator is a sure-fire way to enter into a recession-proof career. You will more than likely be able to find a job with a great company fast if you become a forklift worker in Jacksonville. But, not without proper Jacksonville forklift training. If you’re hiring for forklift operator jobs in Jacksonville, FL, there’s a huge advantage of hiring workers with OSHA training from FLC. The changes of accidents and fatalities are decreased with properly trained lift operators. Plus, in the event of an audit, FLC’s training shows OSHA inspectors that your operators have forklift training for Jacksonville, FL. If OSHA ever stops in for an audit or surprise visit, are you ready? 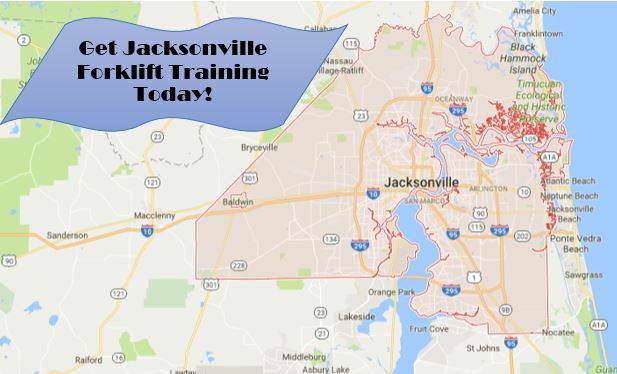 If your company is in the market for forklift jobs in Jacksonville, FL, FLC’s three different training courses – Train the Trainer, Forklift Training Kit, and Bundle Package – ensure every employee is OSHA compliant. As in-demand as forklift operators are, just anyone can’t do the job. Only trained and certified workers are hired into job positions to maintain the standards that are necessary in this line of work. Forklifts are heavy pieces of equipment that can be dangerous, and that which cause injuries and fatalities every year. The majority of these life-threatening accidents are caused by operator error. If you want to be hired for a forklift position and to protect your life, you need to complete a Jacksonville forklift training program. Employers know how valuable Jacksonville forklift certification is. That’s why we’re the #1 option for area companies looking to meet and exceed their OSHA compliance and training needs. There are countless jobs available for forklift operators in Jacksonville who have a Jacksonville forklift certification. Whether you’re hiring a forklift operator, service technician warehouse worker, nighttime forklift operator, shipping and receiving clerk, dock worker, warehouse technician, loader, or reach operator, FLC will get your forklift drivers OSHA compliant with our Jacksonville forklift certification. TRAIN YOUR EMPLOYEES WITH YOUR OWN JACKSONVILLE, FL OSHA TRAINING PROGRAM! FLC gives you the tools and resources to establish common-sense safety practices, more confidence and an efficient, effective forklift fleet – all at a great price! The FLC OSHA training plan works for your Jacksonville, FL facility, or other worksites throughout Florida and the United States. • Dedicated lifetime support. Once you sign up with forklift certification in Jacksonville, FL through FLC, you have a partner for the long haul! • FLC OSHA forklift certification for Jacksonville, FL comes with free 3-year renewal training. No more worrying about being out of compliance – just login and print out your new credentials. With FLC’s forklift training for Jacksonville, FL, you can have it all! If you need to complete your forklift training in Jacksonville and receive your certificate, look no further than ForkliftCertification.com. If you need to get your employees forklift certification in Jacksonville, we can help. The training program is all online, only takes about one hour to complete, can be accessed on any device with an internet connection, is 100% OSHA-compliant, and only costs $299 for the training kit. Create an account and qualify for a new career today with forklift certification in Jacksonville! Check out our OSHA training courses for all forklift jobs in Jacksonville, FL! To speak with our forklift training experts in Jacksonville, FL, please call FLC at (888) 278-8896.